Disc Brakes Australia’s; (DBA) Club Spec T3 slotted rotors are DBA’s most advanced brake rotor on the market. Designed for extreme road and race applications, they are engineered for high performance and are targeted to the aggressive street driver as well as the dedicated track enthusiast. Available as a one piece 4000 Series or a lightweight two piece 5000 Series, both feature DBA’s signature T3 slotting. The tri-symmetrical curve slots are CNC machined to dampen vibration harmonics for a quieter and more responsive pedal feel. With 48 precision machined slots, the number of out-gassing points for brake pad friction gasses greatly increases the consistency and effectiveness of each stop. Being a tri-symmetrical design also eliminates the need for left and right discs. The T3 slotted rotor also comes with DBA’s innovative Kangaroo Paw ventilation system, consisting of 144 diamond and tear drop pillars between the two rotor faces. 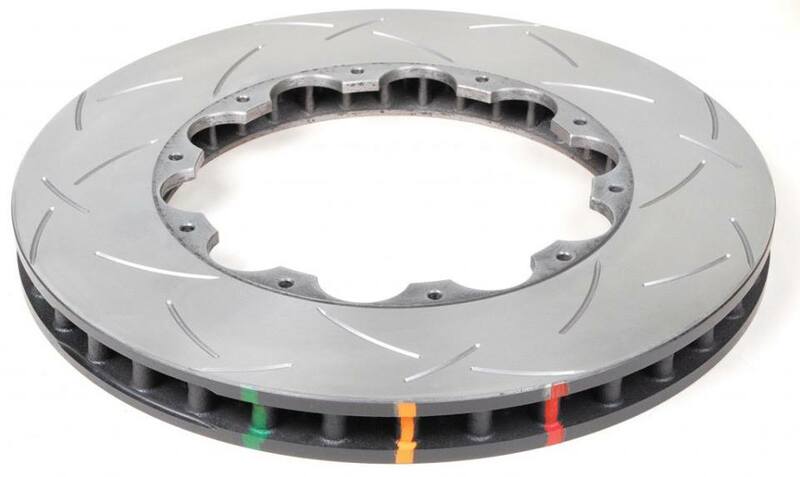 This system increases surface area by up to 59.7% and adds almost 10% greater mass, resulting in greater heat dissipation, minimising brake fade and prolonging the life of the pad and the rotor. The patented Kangaroo Paw system ensures your rotor is stronger, cooler and is designed to out-perform traditional straight-vane disc rotors by up to 20%. However, if the temperatures do build up on the rotor, DBA’s trademarked XG150 High Carbon Alloyed Iron will assist in minimising warping and cracking, prolonging the service life of the rotor. The special formulation allows an increase in thermal capacity so that the rotor may handle constant extremes of heat over extended periods of time. For motorsport and aggressive street applications, the T3 rotor shows its true colours. Thermographic Temperature Monitoring paint markings on the rotor will aid the driver by changing colours at specific temperature thresholds to indicate peak braking temperature. This will help the driver to monitor rotor fatigue and should also assist in helping choose a more suitable brake pad to match the temperatures of the rotor. The 5000 Series two piece rotors offer the same benefits as the 4000 Series one piece item, but offer a lightweight design thanks to the incorporation of Alumalite hats made from 6061-T6 aeronautical grade aluminium. This reduces a great amount of unsprung weight, improving suspension and handling characteristics during high performance use. The ability of the aluminium hats to reduce heat transfer also benefit both the disc rotor and other vital components such as brake pads and wheel hub bearings. Another added benefit is the cost of replacement, being a two piece design, DBA offers replacement rotors for the 5000 series, allowing the reuse of the Alumalite hat. Look out for the red and black DBA Club Spec box if you’re in the market for one of the best high tech, high performance brake rotors. The 5000 Series is now available for Nissan GT-R, Mercedes AMG, HSV, FPV and many more high performance OE applications.